Moving email from one machine to another is a snap when you're using Thunderbird as your email program. I'll show you how. My laptop is having problems, and I want to copy off my email before it dies and move that to another machine. How do I do that? I use Thunderbird. Full disclosure: That's a question I asked myself this morning. After returning from a road trip my laptop started to act "funny". I realize that's not the best of technical terms, but that's about the most accurate I could come up with before further diagnosis. It was running, and I wanted to start some potentially multi-hour diagnostic, so I needed to move my email to my desktop machine. One of the reasons I love Thunderbird: this is really, really easy. Easier than most email programs I know. "Your profile folder encapsulates everything about your email ..."
Thunderbird uses what it calls "profiles" to locate all of the information associated with your email. Your profile folder encapsulates everything about your email: mail, mail folders, email accounts, contacts, installed extensions and so on. Close Thunderbird on the source machine (the machine on which you currently have your email). Install Thunderbird on the destination machine (the machine on which you want to have your email). Run it once on the destination machine, configure nothing, and exit. Locate the profile folder on the destination machine. Erase the contents of the profile folder on the destination machine. Locate the profile folder on the source machine. Copy the contents of the entire profile folder and all sub folders from the source machine to the destination. Run Thunderbird on the destination machine. I'm going to assume that you're running the latest version of Thunderbird, as I was. Download and install the latest version of Thunderbird on the machine to which you want to move your email. Run Thunderbird once and it'll prompt you to begin configuring your email. Cancel that. We do not want to configure anything. With that out of the way, close Thunderbird. This step was necessary to cause Thunderbird to create the profile folder into which we're about to copy our information. While you're at it, close Thunderbird on the source machine. Yours will be different, of course - it won't be "LeoN", and that "8h1k0c0z" will probably be something else. It's in that folder that everything is stored. And I do mean everything. Even though you don't need to do this I'm going to mention it because it's what I do to keep things a little clearer on my machine. You can change the location of the profile folder by editing profiles.ini on the destination machine before you move. That tells Thunderbird that my profile is stored in f:\doc\thunderbird - a folder I created. On my machine "F:" is a encrypted TrueCrypt volume. Regardless of whether you changed it to a folder of your own choosing or left it to whatever that first run of Thunderbird set it to, we start with a simple step. IMPORTANT: this step is performed on the destination machine, the machine you're moving to, the machine that does not yet have your email on it. Make sure that the profile folder on the destination machine is empty. That initial run of Thunderbird may have placed some information there that we simply do not need, and we don't want to confuse subsequent steps. Copy the complete contents of the profile folder on the source machine to the profile folder of the destination machine. It doesn't matter how you do it; it could be over your network, using CD-ROMs or DVDs, using a USB thumbdrive or hard disk, or any other way you have of copying bits from one machine to another. All folders and sub-folders in the profile folder are copied. In my case, I created a zip file of the entire profile folder contents on the source machine, copied that across my network to the destination machine, and then unzipped it place. Believe it or not, you're done. Run Thunderbird on the destination machine and you should find that all of your email, contacts, extensions and whatnot have all been transferred over. I simply pressed "Get Mail" and picked up where I'd left off. And my laptop is now running that hours-long hard disk diagnostic. How do I move from web-based email to email on my desktop? Moving from a web based free email service to downloading email to your desktop is a smart move, but often not as easy to do as we'd like. The method described implies that both machines are running the same version of Thunderbird. I think there was a change in the way TB stored its addresses going from V2 to V3 so this method might not work if widely different versions of TB were involved. It is meant to run from a flash drive but can be installed to a convenient spot on a system HDD. When installed on a system HDD no registry entries are made. Once installed a desktop shortcut is created to the PortableThunderbird.exe. To move to a new machine just copy the entire folder containing Thunderbird to the new machine. Make a shortcut to the .exe and you are done. Something to consider for the future. Quite a few of my programs are standalone for this reason. I install them on a separate partition as well. 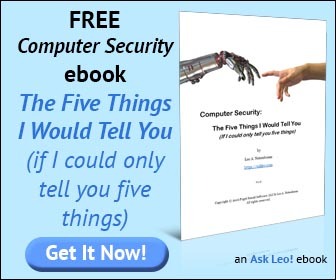 Leo's method should work for Thunderbird installed on a linux machine. Sorry typo in my previous comment. is of course your real username. Ok the software here won't let me post the info I want correctly. that the user substitute his\her real username. The newsletter software insists on replacing the bracketted info with //. I do not use Thunderbird, yet, have studied the subject: Acording to the Mozilla sites you can backup and transfer with MozBackup. Does that not work? It may. Given the simplicity of the process I've outlined above I've never felt the need. to move mail in t'bird use mozbackup. free program that works well. Yes Mozbackup is the way to go for backing up your emails as well as your whole profile. Not only in Thunderbird but also with Firefox. Saves all your bookmarks and even your add-ons. Much easier than trying to find you profile and back it up manually. I recently installed Firefox on our laptop while away from home, because I couldn't get IE8 to work and, when I rolled back to IE7, it wouldn't work either. Rather than fight it on vacation, I installed FF. When I got home, I installed FF on my desktop, as well. Before we left, I'd installed Thunderbird on both machines in place of Outlook Express. For both programs, I simply used "Good Sync" to sync the profiles using a USB thumb drive. It seems to have worked fine in both instances. I also use Good Sync to backup to an external hard drive. Now that I have that job setup, is there any advantage to using Mozbackup instead? Wouldn't using these to move the profile data change the file properties to "Read Only" and cause problems? I used that method some years back and had to remove the "Read Only" before Mozilla email was able to read the profile information. Yes, read-only may be added, and would need to be removed first. Hi, my google email account is reaching its limit and i would like to take a back up of all the emails onto my external hard disk rather than fill up the current space on my system. So how can i do it? Does thunderbird allow me to install it and access it from the external harddisk? This lets one place the data in an easy place instead of some folder BURIED in some directory structure whose name Microsoft changes from time to time. Click "Create Profile", give it a name, click on "Choose Folder" . . . Thus, a better answer would be to run Thunderbird with the "-p" parm in the destination machine, CHOOSE where to place the stuff, then copy all the stuff from the source machine to the destination one. In fact, because it is difficult to "extricate" one's personal (important) data from under "Documents and Settings" or whatever name MS chose for "Windows du jour" (since a zillion different things are saved thereunder), it's not a bad idea to define a separate folder or drive in which to store one's REALLY importat, personal data. Like Leo, I use Thunderbird and have for a long time. However, unlike Leo, I opt for the portable version of Thunderbird (see portableapps.com) rather than the normally installed version - dare I say the legacy version. I often copy my email and it simply involves copying one folder, a folder that I named and placed. Seems the easier approach. No need to be bothered with sub-folders at all. An easier way to move your Thunderbird profile from one computer to a different computer is to use MozBackup, the backup tool for Firefox & Thunderbird. Download and install Mozbackup (just Google the name and you'll soon find it). Create a Thunderbird backup on Computer A noting where you saved it (I create a folder named 'Backup' on the C drive. Run 'Restore Backup' from the Mozbackup file from Computer A (using USB memory stick or across your network, whichever you prefer) and it will copy across all your settings, emails etc. Job done, plus you've got a simple to use email backup program installed on your computer, for regular use. The article has been read, but unfortunately I have a slightly different twist to this issue. What happened is that when the re-build happened I did not know about a program called MozBackup that lets you backup all of your e-mail and addresses. After the system was rebuilt I restarted my e-mail with Thunderbird to read all of the new messages. This was done because 3 days had passed and I needed to read the new e-mail. After I found out about MozBackup, I re-installed the old hard drive and was able to backup all of the e-mail messages. I then re-installed the new hard drive and backed up all of the e-mail messages. I have kept all of the backup files so if the sequence needs to be changed, that can be done. I then restored the old e-mail messages as I needed the folders that were created. I would like to know if there is a way to combine the new e-mail messages with the old e-mail messages so they are all in one location. If I had to edit the combined list that would not be a problem. The goal is to get all of the e-mails in one location. If there is another way to backup the e-mail files, I can still do that as I kept the old hard drives in case there were any issues with the new install of Windows 7. Thanks for any help or insight that you could give for helping me with this issue. My fault. If you refresh the page that should be fixed now. Sorry about that. cool, now, what about the thunderbird profile.ini? don't I want to copy that over to the new machine as well?